Make brownie batter as directed on box. Stir in peanuts. Spread in pan. Place 24 Reese's™ peanut butter cups in single layer 6 rows by 4 rows on top of batter. Bake 25 to 30 minutes or until toothpick inserted 2 inches from side of pan comes out almost clean. Transfer to cooling rack to cool completely, about 1 hour. In large bowl, beat butter and peanut butter with electric mixer on medium speed until smooth. On low speed, beat in powdered sugar until smooth and creamy. Beat in milk and vanilla. Spread evenly on top of brownie. Drizzle with caramel sauce. Sprinkle chopped Snickers™ and peanut butter cups over top. Cut into 6 rows by 4 rows. Stored in airtight container in refrigerator. To ensure success of this recipe, use full-size peanut butter cups. Change it up! 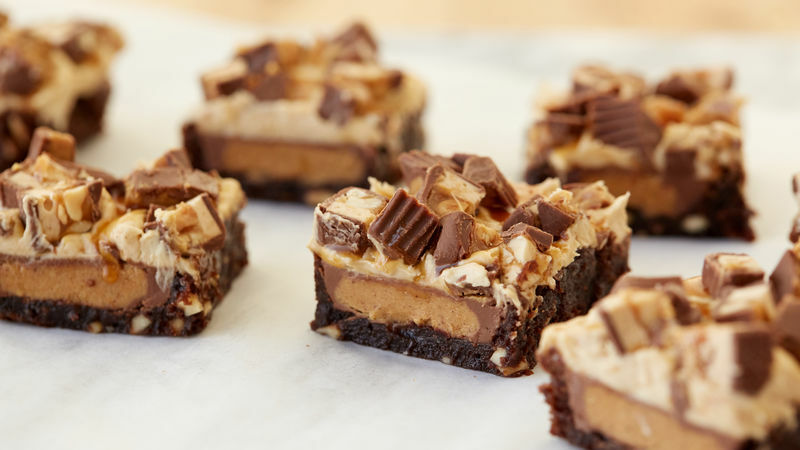 Top the brownie with your favorite candy bar for a new flavor twist!